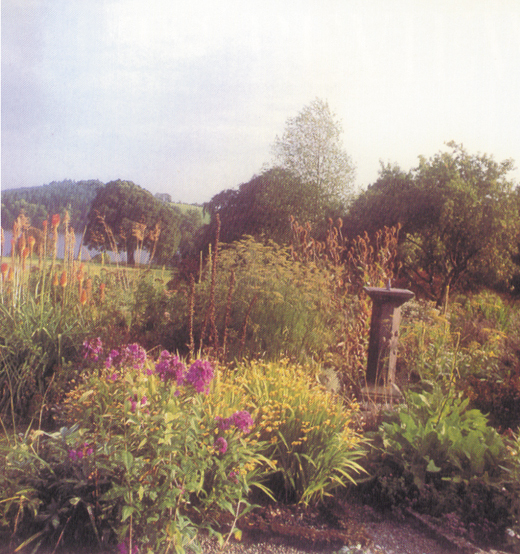 Hugh Mulligan Visits Ireland’s premier retreat For artists and finds a workplace without a time clock. Guthrie’s maternal great-grandfather, the 19th-century Irish actor and play-wright Tyrone Power, was also the great-grandfather of Tyrone Power, the American matinee idol. As a boy Guthrie spent his Christmas and summer holidays in the rambling manor house. When his mother died in 1956, he made the house his home. In the morning room overlooking the lake he blocked out plays for the Old Vic, Sadler’s Wells, Covent Garden and the Metropolitan Opera, and organized season programs for the Shakespeare Festival he founded in Stratford, Ontario and the theater named in his honor in Minneapolis. Always the genial host, “Tony,” as he preferred to be called even after his knighthood in 1961, played host to the likes of Laurence Olivier, Charles Laughton, Flora Robson and others who journeyed here, sometimes by Dublin bus, to rehearse for West End openings. Guthrie liked to entertain his theatrical boarders by playing Tom Moore ballads on the Bluthner piano in the music room after dinner. A trifle yellowing at the keyboard, the instrument is still kept in tune. World class Irish-born pianist John O’Conor loves the resonance of its mellow wood and has practiced here for concerts. 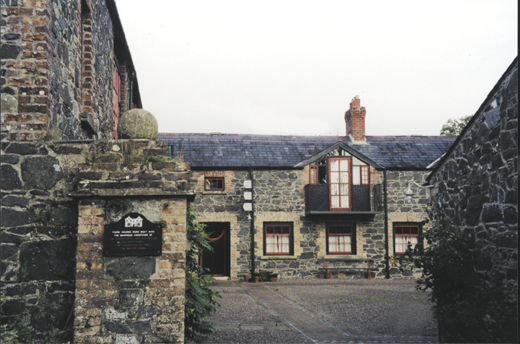 Farmyard houses with plaque commemorating a grant from Guinness. Residents are free to roam the house, build a fire in any of the many ornate fireplaces and work in any room they choose without bothering anyone except the center’s directress Sheila Pratschke. In her three years here she has grown wise to the wants and whims of itinerant artists. “I’m neither writer, poet nor artist, I’m a manager,” admits Sheila, who ran the Irish Film Centre in Dublin before taking over the care of a dozen or more fragile egos in residence here for anywhere from a week to a year. The decor of my own farmyard digs featured colorful African masks, a collage of brass and scrap iron signed “L. O’Neill,” and a large moody landscape of the lake and main house signed “Patricia Jorgensen ’87.” On my rickety pine bed table I found and read “The Pressed Melodean” essays on modern Irish authors by Ben Howard, who teaches literature at Alfred University in New York State. He occupied these quarters in 1990. The Guthrie Centre can accommodate 16 guests between the main house and the farm buildings. Chicago portrait artist Marian Quinn is the current occupant of a studio with an attic bedroom reachable by a perilous parody of a staircase of five-inch-wide half steps, alternating left and right, like rungs on a telegraph pole. Paco Taylor, a travel writer based in Dublin and sometimes Switzerland, is busy writing three books at once on a tiny laptop in a top-floor room. He is certain the long corridor is haunted by a ghost named “Bunty,” a fearsome harridan of enduring legend, who was Guthrie’s nanny. In a farmyard studio, painter Lynne Fitzgerald, from Rathdrum, County Wicklow, diligently covers enormous canvases with flamboyant brush strokes of neon-bright colors, while in a nearby studio, fashioned from what had been a carriage house, young Fergal McCarthy toils for hours turning out exquisite pastel miniatures, wondering all the while whether he should go back to teaching the Irish language for a living. Meanwhile Amanda Davis, a novelist from Brooklyn, frantically fights the Irish telephone system trying to transmit revisions to a book weeks overdue at her publisher. After half a century of covering hard news as a globe-trotting reporter for Associated Press, I had come to Annaghmakerrig for a career turnabout from fact to fiction. I was six chapters into my first mystery novel, A Christmas to Forget at 221B, since completed and now in the bookstores. All residents are honor bound to respect the creative privacy of others, but one chilly morning Jeremiah Cullinane, a film writer from Howth on the Irish Sea, appeared at the door of my barnyard writing den to beg a cuppa tea. He proceeded to build a fire of “Monaghan sticks” — stunted logs — in the wood stove and asked if we could chat a moment or two about, of all things, the Berlin Wall, which I had visited on a final AP assignment before retiring. During my two-week tenure, my fellow artisans occasionally shared their creative efforts by reading aloud a chapter or a poem after dinner, and a few even shared their procrastinations. The place is quiet all right, deliberately so. No television, stereos or VCRs, and just two pay phones, one hung in a dimly lit cubbyhole beneath the ornate staircase, the other in the glassed-in conservatory was out of order the entire time I’m there. An essayist named Celia from College Station, Texas was greatly embarrassed at breakfast one morning when the cell phone concealed in her Aran knit jumper suddenly jangled. “It’s only for incoming calls,” she guiltily apologized. A single copy of the Irish Times arrived each day at whatever hour the mail van ventures up the winding road, and we took turns catching up on the outside world. The crossword puzzle is a communal activity. 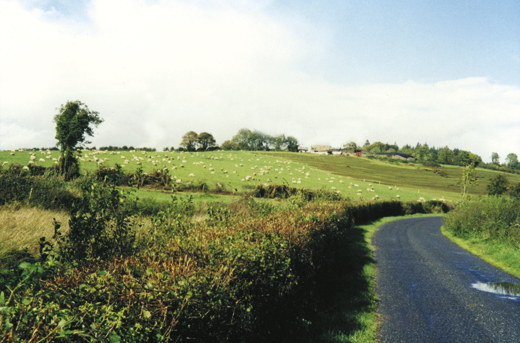 Sheep grazing on the farm. 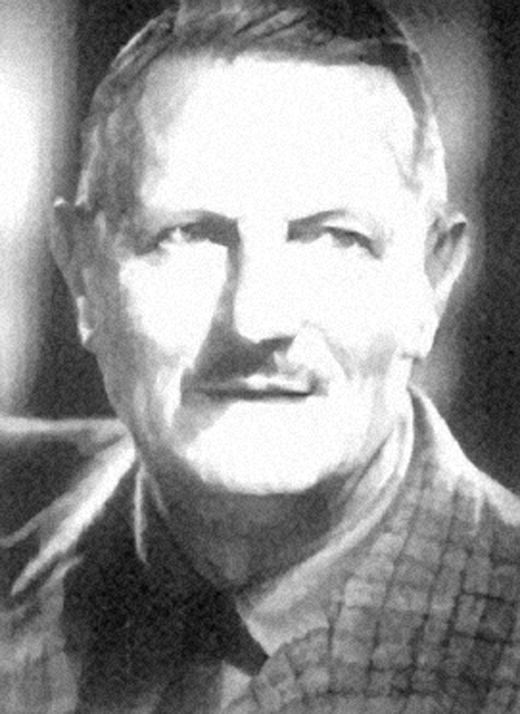 According to various local legends, Tyrone Guthrie died at his desk before the tall bay windows in the morning room while either working on a play by Jack White for the Abbey Theatre, organizing a theater festival for Australia or wincing at the electric bill. The latter, according to Sheila, can be quite shocking. It costs about a half million dollars a year to operate the center, which is administered by a board appointed by the arts councils of both the Republic and Northern Ireland. His will also made another stipulation that adds immeasurably to the joy of staying here and in a subtle way spurs creative productivity. View from the attic window. Promptly at 7 p.m. we are summoned to the long pine table in the dining room by the striking of a brass gong that might have heralded a J. Arthur Rank comedy — a zany, unscripted comedy at that. Every night there are more laughs, more genuine witticism from that odd mix of different disciplines than from any other group — college, military or media — that I have ever encountered at table. The writers disdain talk about their genre or oeuvre. The painters don’t mention their milieu or discuss works in progress. Poets like pretty Leontia Flyn (sic) from the Mountains of Mourne refrain from sharing lines whispered by the muses on her daily three-mile hike around the lake. On sunny afternoons, like John Updike, P.G. Wodehouse and Somerset Maugham, I sometimes sought inspiration at nearby golf links but kept mum about my writing progress as well as my scorecard, which was even more discouraging. 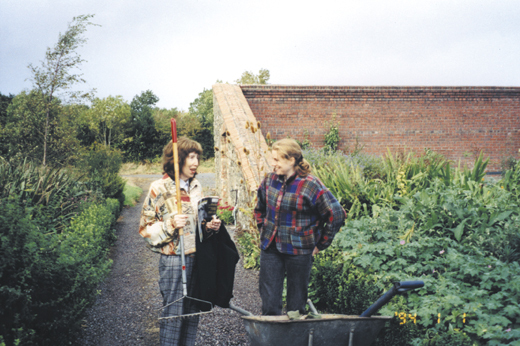 Ecologist Valerie Waters, an on-camera reporter for Irish Television, detailed her frustrations at trying to restore the estate’s classic herb and vegetable garden near the old water tower with apprentice laborers. The memory of this prompted her to keen a melancholy lament in Irish, which provoked a general sing-along. Brigid Mulligan chats with ecologist Valerie Waters. I don’t recall why — there being no cocktail hour and only Australian wine at dinner — but one night I recited “The Cremation of Sam McGee” without provocation. And Brigid, my Irish-born wife (South Armagh), read fortunes in tea leaves. In the dear bygone days, Tyrone Guthrie loved to lead his guests in charades after dinner, raiding the steamer trunks in the attic for Victorian plumed hats and period costumes. In this same spirit, after everyone helped clear the table, we sometimes played board games like Scrabble, with double-value tiles for inserting a word in Irish. One evening the game of choice was Pictionary, where the odds favored the artists over the authors. When the fire in the hearth burned low, ghost stories gathered from all ends of the table. All of them true. 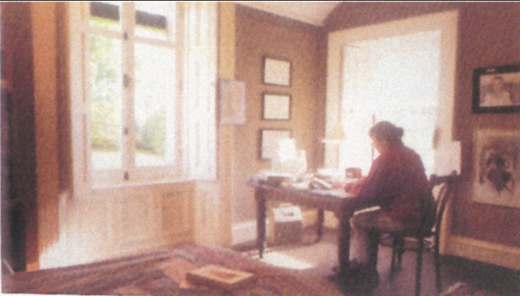 Guthrie’s fond hope was that Annaghmakerrig would one day produce “a new breed of playwrights to astonish us in the morning.” In the two decades since the Centre opened on Oct. 10, 1981, more than 2,000 artists from 53 countries have brought their dreams to his dream factory. The roster includes poets, playwrights, choreographers, composers, photographers, story tellers, interpretive dancers, weavers, sculptors, set designers, mask makers, rock, jazz and classical musicians, even translators and kung fu practitioners.